OK, I wasn't going to post this picture, or write it up; but it's been haunting me and so I have to place it somewhere. I decided to take the shot because it caught my eye while I was looking for boxes in the box room/gallery. My son stores his canvases in my "box" room at work because there is not much room in his bedroom. My challenge for this week in the on-line photo challenge is to "fill the frame." The picture itself would fill the frame; but what I saw was the grill underneath the picture as part of the whole statement. 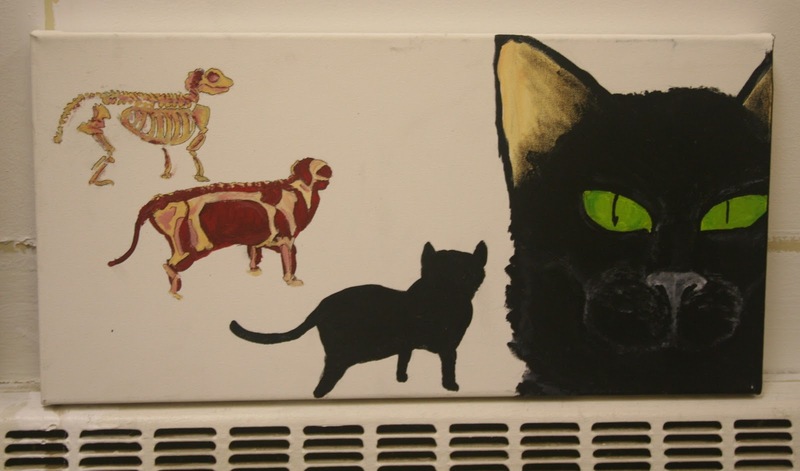 The picture develops the under structure of the cat and the radiator is the understructure of the building, plus it looks like the "teeth" of a very menacing animal - would the cat evolve to that? I'm not sure; so I thought that I would ask an expert. I think he said that my problems aren't his problems so - "get lost". See if I give him anymore animal crackers!!! !